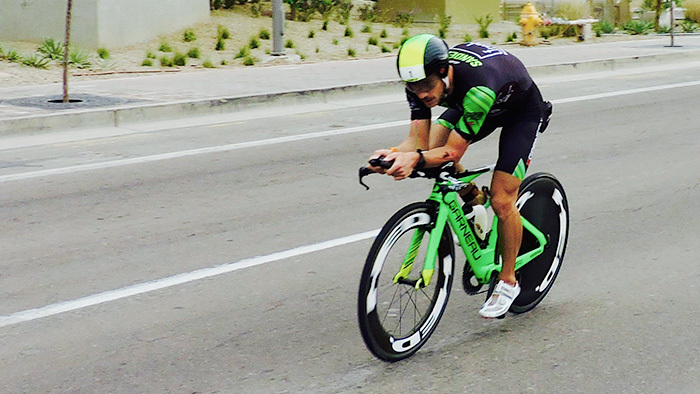 IRONMAN Arizona has had some extremely fast times over the years, including the breakthrough performance by Lionel Sanders in 2015 where he broke the 8 hour barrier with a course record time of 7:58:22. While defending his title this year he not only bested his 2015 time, but went on to shatter his own course record enroute to setting an IRONMAN record time of 7:44:29. So how big of an achievement was this for Lionel? That determination coupled with a smart race plan allowed him to put together an amazing total effort from start to finish and take the record. Starting with the swim, Lionel, who admittedly struggles with the discipline, gave up around 4 minutes to most of the lead pack swimmers. While this sounds like a lot, his time was around a minute faster than 2015 and a vast improvement over a race like Kona where he came out with an 8 minute deficit. With Lionel’s stellar bike/run prowess, a 4 min gap is much more manageable and the course at Arizona favors his riding style and high end steady effort. View Lionel Sanders’ bike file. Looking at the data on the bike it’s apparent that he followed his strategy perfectly, holding a power target of 315 watts as steady as possible. While this seems like a massive amount of power, for someone like Lionel who has a Functional Threshold Power (FTP) around 400 watts, his race Intensity Factor (IF) was only .79 which for pros represents a reasonable effort. Lionel’s Normalized Power (NP) was 317 watts while his Average Power was right at 315 watts. This equates to a Variability Index (VI) of 1.01, meaning that he rode the course about as steady as possible. The only minor power fluctuations came on the steepest parts of the climb and descent on each lap. 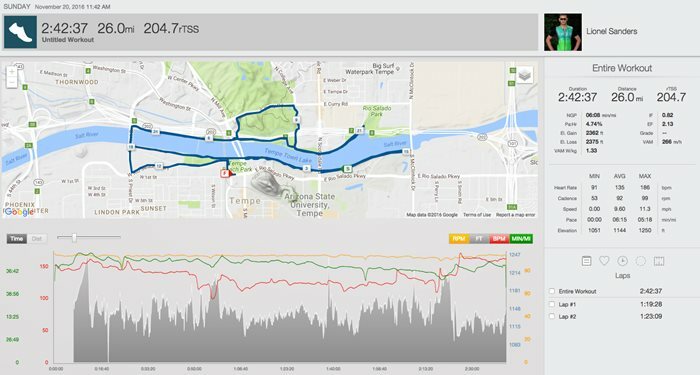 At a total ride time of 4:04:38 and NP of 317 watts, Lionel’s Training Stress Score (TSS) was around 254.5, a number where he knew he would be able to run. Despite having the fastest bike split, Lionel was 2nd coming off the bike to Cameron Wurf, a former professional cyclist who had gained enough time in the swim to just hold on to the lead heading to the run. After a quick pass of Wurf, Sander’s started to execute his run strategy. View Lionel Sanders’ run file. You can see in the run data that Sanders went through the first half marathon very quickly with a time a bit over 1 hour 18 minutes. From there, his pace slowly declined from a 6 minute pace to a 7:20 around mile 23. At this point he knew what he needed to do to break the record and his renewed motivation helped him increase his pace back to a 6:20 minute/mile for the last 3 miles to the finish. 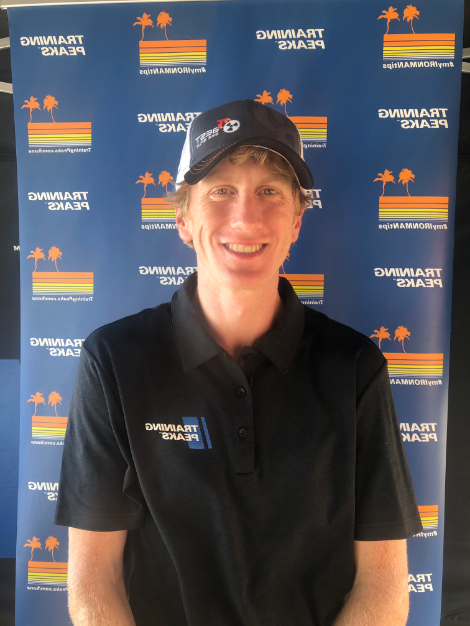 His run split was 2:42:31, which was fast enough to hold off a charging McMahon to defend his IRONMAN Arizona title and take the IRONMAN Record.